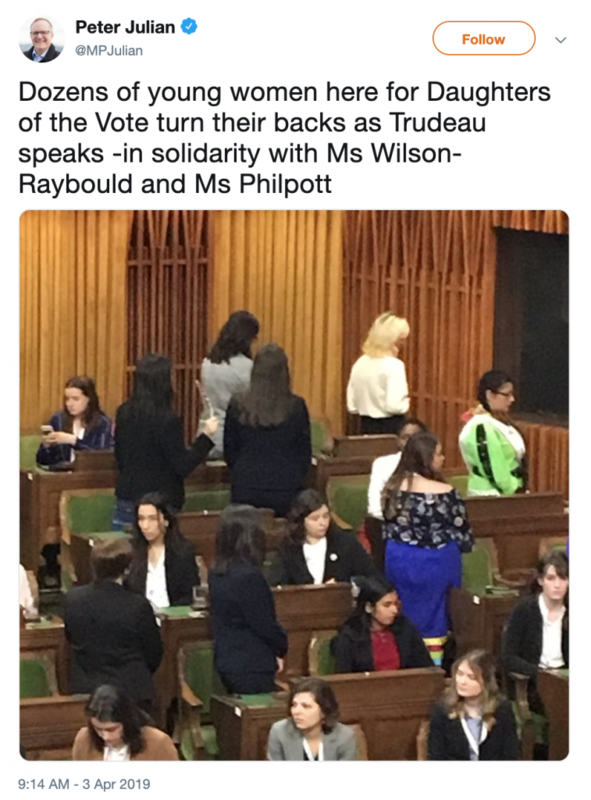 On Wednesday morning, 338 young women filled the seats of the House of Commons and spoke about their concerns for Canada and hopes for the future. This is the second time that Equal Voice has hosted Daughters of the Vote, bringing a diverse group of women aged 18 to 23 to Ottawa to meet with parliamentarians, attend leadership workshops and help make the connections that will hopefully propel many of them into public office. Organizers couldn’t have predicted the heightened tension on Parliament Hill this week with the expulsion of former Ministers Jody Wilson-Raybould and Jane Philpott from the Liberal caucus Tuesday night, the latest turn in the ongoing SNC-Lavalin scandal. The damning imagery of ejecting two of the Liberal’s most celebrated feminist elected representatives was lost on no one. The voices of thousands of Ontario high school and middle school students, on the other hand, echoed loudly yesterday as they walked out of class to protest proposed government cuts to education. A viral post by Natalie Moore, a Grade 12 student at Listowel District Secondary School, started the movement, building on a provincewide action in September when students protested the planned rollback of the 2015 Health and Phys Ed curriculum. In the space of a few weeks, thousands of students were organizing, conducting outreach, preparing communication materials, and fielding media calls. There are currently over 50,000 signatures on their online petition, and counting. In Quebec, more than 150,000 students walked out of school last month and took to the streets across the province as part of climate marches around the world, inspired by 16-year-old Swedish activist Greta Thunberg, who began holding solitary demonstrations outside the Swedish parliament last year. It was a stark display of the alarm of a generation and the anger directed at older generations who are not taking climate change seriously enough. The 20 warmest years on record have all come in the past 22 years, essentially the lifetime of today’s children and young adults. Daughters of the Vote delegates also spoke about climate change and other pressing issues in House of Commons and at various Committees. Hannah Martin, a Mi’kmaq delegate from We’kopekwitk (Millbrook First Nation), challenged Justin Trudeau about the controversial Alton Gas project in Nova Scotia and the government’s failure to protect the river and traditional fisheries from devastation and uphold Indigenous rights. Immaculee Kalimurhima spoke of her years living in refugee camps and how difficult it was for her family to establish themselves when they arrived in Canada. Her highly skilled parents couldn’t find work; their education and experience “counted for nothing,” she said. They have been forced to take additional training at considerable cost, while she herself has had to care for her younger sibling, juggling school and work to support the family. Foreign credential recognition is a huge barrier for new immigrants, consigning many to years of poverty. Megan Linton, a disability rights activist and student from Winnipeg, spoke of the damaging impact of institutionalization for people with disabilities, a practice that continues to this day. The continuing lack of community supports undermines the fundamental rights of people with disability and their quality of life. “Warehousing people is not feminist,” Linton concluded. Phoenix Nakagawa, also from Winnipeg, spoke about the profound transphobia she has experienced in her efforts to participate and compete in rowing. While her own club has supported her dreams, she has been humiliated time and again at provincial and national competitions. “Where is the government’s accountability?” she asks. But no more. Daughters of the Vote, Ontario students, and young climate activists across the country and around the globe are speaking out, reclaiming their right to a sustainable, supported and empowering future. And it is about time we listened.